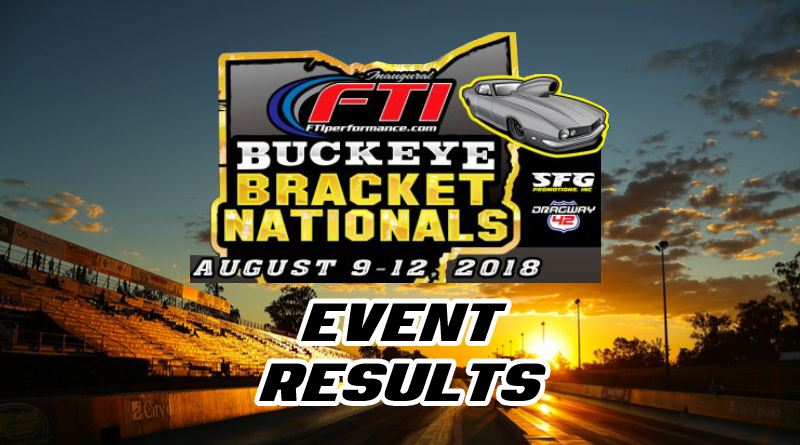 West Salem, OH – The FTI Performance Buckeye Bracket Nationals began on Wednesday, August 8th at Dragway 42. The SFG Promotions team has a huge event scheduled throughout the weekend with $75,000 to win on Friday, Saturday, and Sunday. Prior to the main events, there was a $5k warm up race on Wednesday that was won by Jaeden Durst in his pickup truck. Thursday’s action included another “warm up” race with $15,000 up for grabs to the winner. Leave it to the SFG guys, they’re warm up races pay more than most main events. When the smoke cleared, a familiar face was holding the big check as Lane Ledford took the win over Hank Mulligan in the final. With the win, Ledford added to an already impressive season. Earlier in the year he picked up a $50,000 race win. He followed that up with a dominating run at the World Super Pro Challenge last weekend at the Mid Michigan Motorplex where he reached the semi-finals of the $50k main event on Saturday night. If that wasn’t enough, Lane reached the final round of the Sunday $5k event where he raced his father, Jeff Ledford. Jeff was also a semi-finalist in the previous night’s main event. Congratulations to Lane and his family for another great win! With Friday’s racing hampered by rain, the Friday $75k was completed on Saturday with Schuyler Turner taking the win over Charlie Flanagan. Saturday brought another huge $75k payday as Randy Scheuer Jr. took home the big check with the win over Steve Law. Sunday brought the final $75k race of the weekend. CJ Drake captured the big win, taking his dragster to the winner’s circle over Greg Rose in his Mustang. No big dollar bracket race would be complete without mentioning Nick Hastings. Surprisingly Nick didn’t win a main event over the weekend but he didn’t leave empty-handed as he won the Shootout race for $8,750. Will it ever end? All he does is win, win, win. In addition to all of the big money events scheduled for the weekend, SFG put together a 16 car Top Dragster field. The fields are full for all three days. Pretty cool to see 16 fast dragsters competing on bracket racing’s biggest stage. Congratulations to all of the event winners and a special thanks to SFG Promotions!